The secret to any event is a very simple equation….what goes in, must come back out. 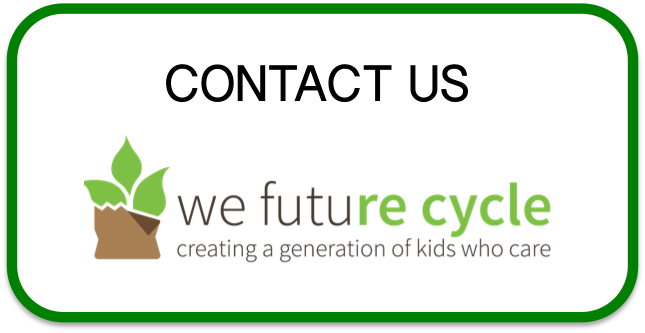 Under the guidance of Elementary Principal Dr Simone Bruemmer, and Green School coordinator Cynthia Nichols with help from We Future Cycle, 400 students and parents had a wonderful day of fun activities and all without creating ANY TRASH AT ALL. The parents in charge of refreshments brought only finger food foods without any plates, spoons or napkins that needed disposing. Clothe table linens were used, and instead of disposable single serve water bottles for hydration, the students brought their own reusable bottles and went to the watering station for refills. All there was to dispose was the melon rind or the fruit kebab stick, both finding their way into the clearly labeled compost bin, to be sent, together with the lunchroom food waste to the commercial composting site. This school is an inspiration! Recently White Plains Ridgeway 2nd grade students learned all about how important worms are for this world. They listened to a presentation about them, and got down and dirty to check them out up close and personal. And now they are taking care of them and are writing about them. Check out what Maria and Saul have to say about them. Worms Are Awesome! Worms are important for our environment because they eat food waste and then poop out rich soil. The worm poop is called castings. Their poop has a lot of nutrients for the soil and is good for all the plants. This is called compost. They eat our food waste, which doesn’t only help them but helps Worms eat half their body weight every day! Worms have to stay under the soil and the leaves so they don’t dry up and die. They have to be moist. Our class is learning about worms and worm composting. We are trying to recycle and reuse stuff so it cannot go into the landfill. We set up a worm composting bin in our class. It is called vermiculture. Our worms eat our natural snack waste. We gave them banana peel, watermelon, and strawberry. We made a hypothesis to predict what food they would eat first. Most of us guessed watermelon. We observed for a week and discovered they ate more watermelon. Our hypothesis was correct! Next we will give them an apple core. We think they will love it! Under the leadership of Deatra Bailey, 2nd grade teacher at Barnard, students are combining lessons of economics with being environmental. To raise money for reusable sandwich pouches as part of the ongoing effort to cut down on single serve packaging that ends up in the trash, Students are selling healthy snacks taking turns to be the cashier or accountant of the operation. Barnard Elementary school has students from Pre-K to 2nd grade, but even the kindergarten students are now old hands at sorting their waste. Barnard joined the We Future Cycle program in January and has been exemplary in continuously teaching environmental awareness. Recently the students learned how to become waste free at snack time. Each time they bring in a completely waste free snack, they are rewarded with a leaf, this leaf, complete with name goes onto a tree in the lobby of the school, to be admired by everyone. Barnard is now sporting a veritable forest of trees.